Today, more and more construction companies are going the modular route. It is no secret that modular construction is a lot cheaper and less time consuming than traditional construction. But did you know that it also has numerous environmental benefits as well? Modular buildings on the whole are a lot more environmentally friendly compared to traditionally constructed buildings. Let us look at why you can go green by opting for modular construction. Often, offices or large institutions like schools, hospitals, hotels and so on find themselves in need of additional space. This need may be temporary or permanent, but either way, institutions are always hesitant to make permanent structural changes to their buildings. With modular construction, you always have the option to rent a portable space on a temporary basis or for as long as you may need it without having to make permanent structural changes to your buildings. Nearly 90 per cent of the construction of a modular building takes place off-site, hence the term “prefabricated buildings.” With this approach, there is significantly less disturbance to the environment surrounding the construction site. Also, because these buildings are prefabricated in a controlled factory environment, there is negligible wastage of materials resources and highly efficient use of energy. It takes almost 50 per cent less time for the building to be complete compared to a traditionally constructed building. Furthermore, modular buildings are installed with energy efficient systems like energy efficient glass, geothermal systems, solar panels and other green features. As a result, not only is the actual construction of the building green, but the long-term running of the building also works out to be quite sustainable. 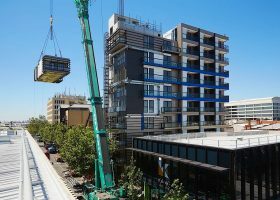 Not only can modular construction reduce energy consumption during the building process by around 67 per cent, it also reduces energy costs for its occupants. Technology has made it possible for us to recycle almost anything. Modular buildings are constructed with recycled (and recyclable) materials for the most part. Recycled steel, recycled wood and even recycled glass are a large part of what makes up a modular building. For instance, Mobile Modular uses 100 per cent recyclable glueless carpet tiles made from post consumer materials. Granted, not every part of the building can be made of recycled material, but all these parts can certainly be reused over and over again without seeing much wear and tear. Modular buildings are called “portable buildings” for a reason. They can literally be transported from one place to another without having to go through the gory process of demolition. The term “modular” comes from the fact that these buildings are built one module (or unit) at a time and are then assembled on site. So, it stands to reason that they can also be dismantled. This makes it very easy to take down the building without disturbing the surrounding environment with dust, debris and other unwanted pollutants. Those are but a few of the wonders of modular construction. Their environmentally friendly nature is only another added plus that you will save a whole ton of money during construction and even in the long run. what is your source for 67% energy saving for prefabricated over sit built? I build modular construction and normal domestic. Most of what you say here is wrong. They are not constructed with recycle material. They use similar material to conventional homes.